A consultant is the bridge and the enabler for successful ERP implementation. Enterprise Resource Planning (ERP) systems are the heart of modern, complex manufacturing organisations, the system of record and quite often the single source of truth. For most organisations, an ERP is implemented with the goal of improving business performance, ensuring regulatory compliance, and to boost employee productivity. Typically, ERP projects will incur change to business processes, and on many occasions the change may be substantial. Change is always difficult to implement in any organisation. However, when change of this magnitude is involved it can be particularly difficult to implement. Ultimately, the success of the implementation depends upon these changes being embraced by employees at all levels. Independent research reveals a sobering figure. Gartner estimate that 55 per cent to 75 per cent of all ERP projects do not meet all of the project objectives. Considering the level of investment involved; that so many projects fail to achieve their planned objectives is of huge concern. Why do so many companies fail, despite undertaking a diligent process to select an appropriate ERP solution? Many embark upon their ERP implementation in a rush to start using the solution. As a result, they may neglect the prerequisite planning steps that would ensure success. The key is the realisation of measurable business outcomes. Achieving this is compromised from the outset if there is no explicit business-owned strategy, well-defined plans, and an agreed-upon architecture. Increasingly companies are turning to independent ERP consultants with expertise in change management to drive the success of their implementation projects. Consultants offer experience and best practices that increase the chances that the project will be completed on-time and on-budget, and with the desired objectives. Implementing ERP is a time for change: the objective to make business processes more efficient. These changes should support the larger strategic objectives for the company. When introducing new business processes or new technologies into an enterprise, a best practice is crucial to assess the business impact on the associated people, processes, and technology as early as possible in the project. Consultants have techniques to perform gap analysis on existing processes and to map from what exists -“as is”- to what is intended - “to be.” This step gives leaders an opportunity to understand the potential growing pains involved, which can include business disruptions, costs, and a number of other impacts. With this perspective they can determine whether the organisation is willing and able to make the envisaged change. The project team is also provided with an opportunity to make adjustments to achieve a more acceptable level of business impact before starting development processes, should the projected scope prove to be too ambitious. Such analysis can help keep the implementation project on track and provide the foundations for success later on. Gartner estimate that 20 per cent to 25 per cent of ERP projects are delivered late and/or over budget, and fail to deliver the expected benefits, or end up being abandoned. As if this weren’t enough, they go on to establish that a further 50 per cent to 60 per cent of projects are viewed as compromised in some way - typically due to erosion of, or failure to achieve the expected benefits. Industry research has found that in almost every instance of project “failure,” a key contributing factor was mishandling of the associated organisational changes. Ideally, training would begin before implementation and continue throughout the project. Most people experience a sharp decline in the retention of new information when exposed only once; only 20 per cent of learning will be remembered in the first month, unless the material is consciously reviewed. When training is reinforced, competency levels increase as the new information is assimilated. An experienced ERP consultant will have the necessary skills and tools to help employees adjust to the new solution and the accompanying processes. Implementing ERP requires a constant stream of decisions and changes to business processes. Members of ERP implementation teams are chosen for their expertise in a specific business area, and probably have other responsibilities even as the implementation project is underway. However, consultants are able to maintain focus on the project, allowing the team to direct their skills and knowledge toward improving business processes. Real success is measured in the achievement of business outcomes. Consultants can help ensure that project sponsors are informed of the team’s progress and decisions. Once the solution has gone live, you will want to measure the actual results and compare to expected objectives and ROI. While some benefits take longer to realise than others, some smaller benefits are immediately seen; with most organisations achieving objectives within 18 to 24 months of going live. The experience that a consultant brings will result in greater levels of success in meeting the project objectives. According to industry analysts, their clients have consistently stated that if they could do one thing differently regarding their ERP deployment, it would be to spend more money and effort on organisational change management and training. Industry research has identified five phases that track how technology is embraced: from the trigger point, to a peak of inflated expectations - through to a plateau of productivity. Early successes are often followed by a number of failures, resulting in a period where engagement wanes and implementations fail to deliver. The depth and length of this “trough of disillusionment” is directly related to the effort and money spent on managing the organisational changes associated with the project. 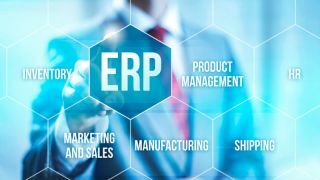 The benefits an organisation plans to realise from a new ERP system will not materialise until - and unless - users have embraced and are productive on the new applications and processes. A consultant is the bridge and the enabler for successful ERP implementation. Working with a consultant can reduce stress on your organisation, minimise the risk of operational disruptions, and improve adoption rates. Given the odds, and the scale of your investment in implementation, engaging a consultant is less a matter of choice and more one of necessity.